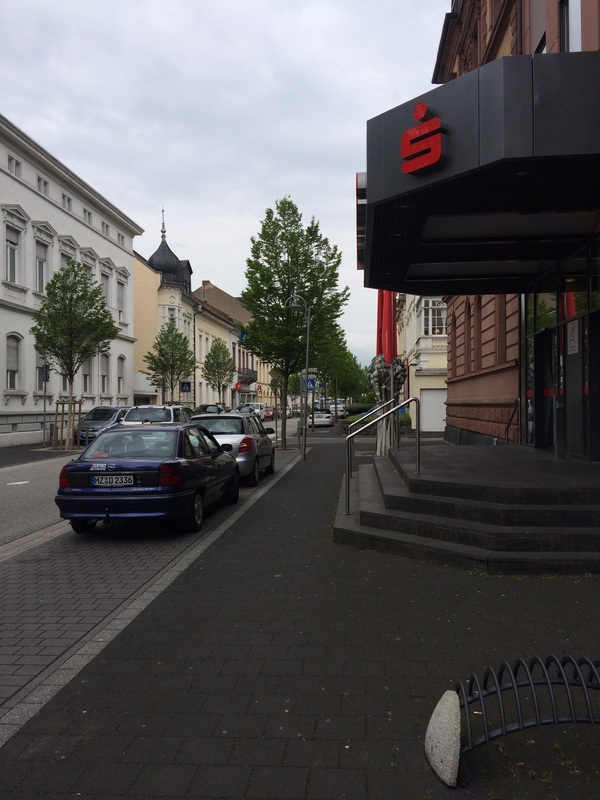 We have returned from our trip to Germany, and I have many things to share about the experience. It was a trip filled with many joyous moments as well as many sad and heartbreaking moments. 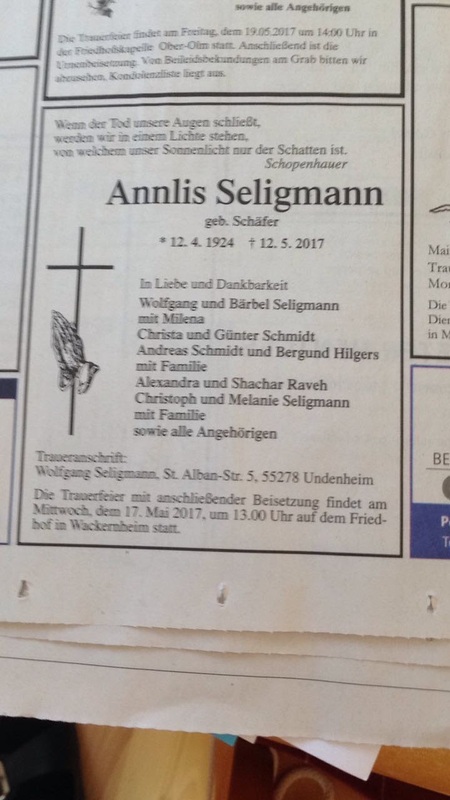 One of the greatest joys and definitely the saddest moment involved Annlis Seligmann, mother of my dear cousin Wolfgang. When Wolfgang found my blog almost two and half years ago, it was the result of a family research project he was sharing with his mother. Annlis was not born a Seligmann; she was born Annlis Schäfer on April 12, 1924. But in 1965 she married Wolfgang’s father Walter Seligmann, who died in 1993, and she was fascinated with the history of his family. 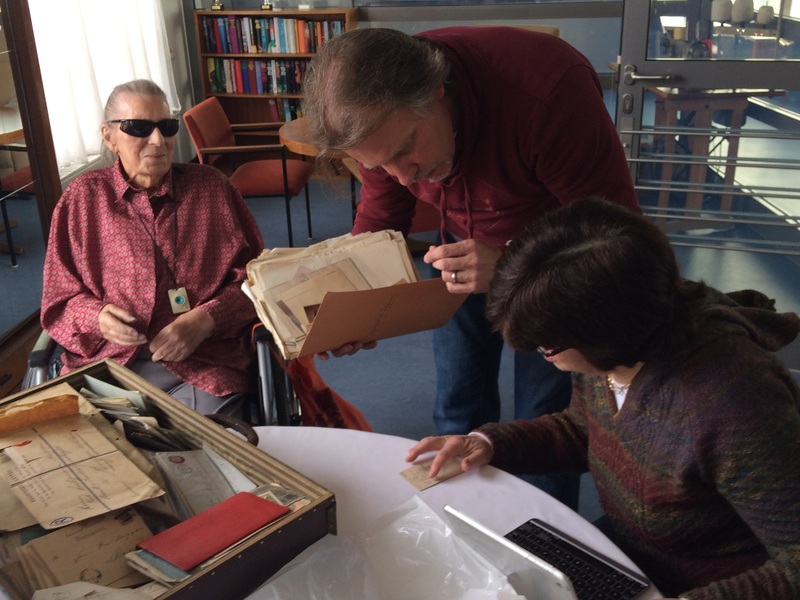 When the Seligmann family discovered the “magic suitcase” that had belonged to Walter’s brother Herbert, Annlis and Wolfgang began to search through the documents to learn more about the Seligmann family history. Because Wolfgang could not read the old German script, Annlis had to decipher many of the old records and documents for him. At some point in this process, Wolfgang discovered my blog, and together the three of us—Annlis, Wolfgang, and I—all worked together to find many of the missing pieces of the Seligmann family. We were able to figure out how many of the people named in those documents were related to us all. Without their help, I would not have found many of the Seligmanns who died in the Holocaust or who, like my cousins Lotte Wiener Furst and Fred Michel, were able to escape Germany before it was too late. So when I was planning my trip to Germany, one of my priorities was to meet not only Wolfgang, his wife Bärbel, and daughter Milena, but also his mother Annlis. We arrived in Germany on May 2, and the first thing we were scheduled to do on May 3 was meet Annlis. 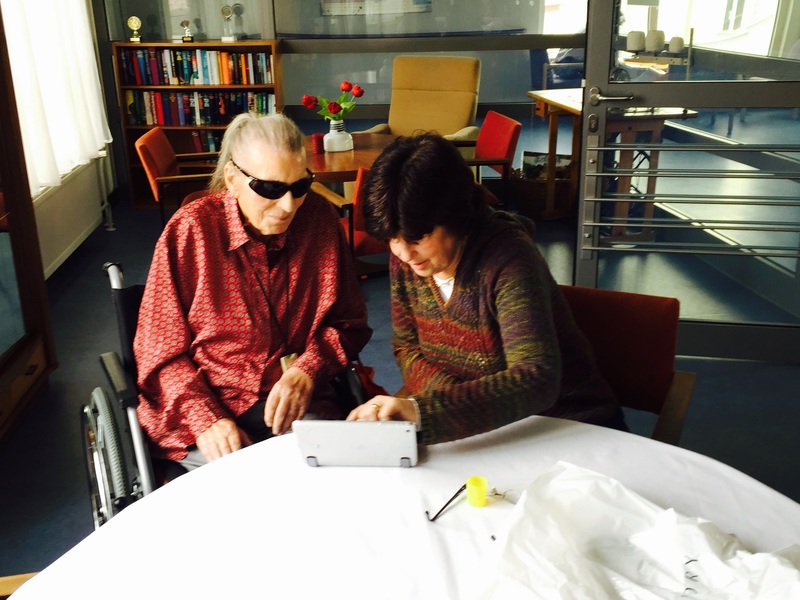 We went with Wolfgang to the senior residence where she was living in Mainz (like an assisted living facility in the US) first thing that morning. Annlis did not speak English, so I was able to test my baby German. With Wolfgang’s help, we were able to communicate. She and Wolfgang showed me some family photographs, and I shared with her photographs of my parents, children, and grandchildren. We looked through the magic suitcase together (there are still hundreds of letters and postcards still to be translated). Despite the language obstacles, I felt a strong connection to Annlis and was sad to say goodbye when our visit ended. Annlis had been in declining health in recent months. 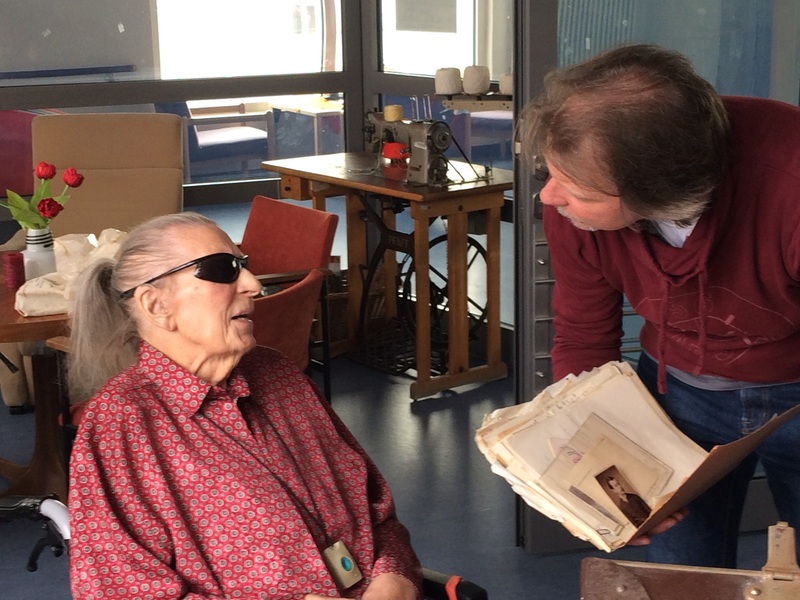 Her vision had become so poor that she could no longer read and help translate the documents, but she remained very interested in the family history and, according to Wolfgang, had been very anxious to meet me. After our visit, she expressed to Wolfgang how happy she had been to meet me. I was so touched and, of course, felt the same way. So you can imagine my shock when less than ten days later while still in Germany, I received a message from Wolfgang telling me that his mother had died. I was stunned and so sad. And heartbroken for Wolfgang and his family. Annlis lived a long and full life. From Wolfgang I know that she grew up in Mainz where she also lived for the last five years of her life. During World War II, she was working in Bingen. In September, 1944, she witnessed the murder of an American soldier, Odis Lee Apple, whose plane had been shot down and crashed nearby. 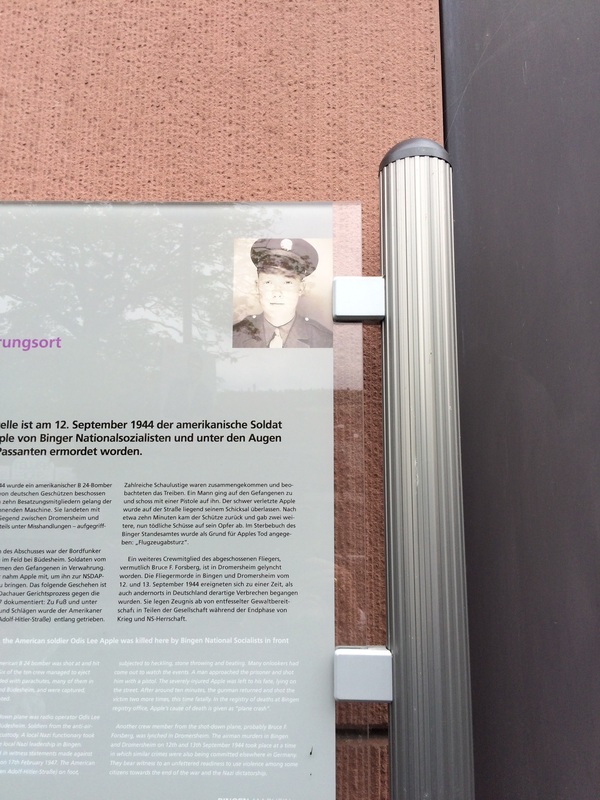 As described here by Wolfgang himself on the website for the radio station where he works, the caretaker for the building where Annlis worked notified the people in the office that an American soldier was walking on the street outside the building. Annlis and three of her co-workers left the building and followed Apple, whom she described as a man with a friendly face. Then suddenly the building’s caretaker rushed out onto the street in his SA uniform and shot Apple. He did not die right away, but was suffering terribly from the gunshot wound. At some point someone else shot him, and he died. After the war, the US Army investigated Apple’s death; Annlis provided testimony, and several people were sentenced to prison. The caretaker, however, had died not long after the shooting during a bombing attack on Bingen. According to Wolfgang, his mother never forgot this incident and was horrified by what she had witnessed. Even though at that point the US was at war against Germany, Annlis knew it was wrong to kill someone in cold blood like that. It was not until twenty years after the war that Annlis married Walter Seligmann in 1965. Together they raised their son Wolfgang in a neighborhood outside of Mainz in an apartment overlooking the valley. She lived in that apartment until five years before her death when she moved to the building where I met with her on May 3. Annlis Seligmann lived a good and long life; she had just turned 93 a month before her death. I feel so privileged and fortunate that I was able to be a part of her life in the last two years and especially that I was able to meet her in person, share some time with her, and give her a hug. My heart goes out to Wolfgang, Bärbel, Milena, and the entire extended family. May her memory be a blessing. 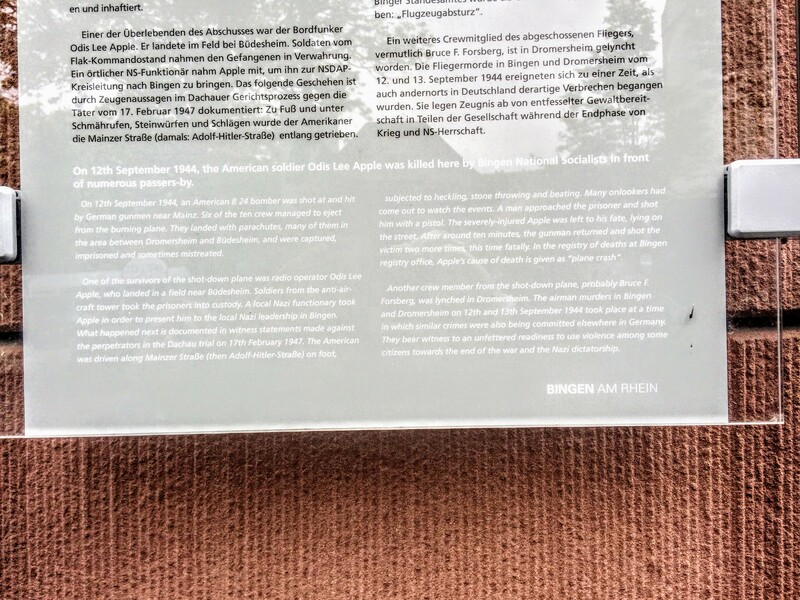 This entry was posted in Bingen, Genealogy, Germany, Germany trip 2017, Seligman/Seligmann and tagged Bingen, Germany, Mainz-Bingen, Seligmann, Travel, World War II by Amy. Bookmark the permalink. I am so glad that you both got to meet and go over family history that is clearly very dear to you both. Annlis lived a long and eventful life, something many of us fail to do. I am looking forward to hearing more on your trip. Thank you—it is an experience I will always cherish. Wow – how fortunate you were to meet her. What a touching story – I have tears in my eyes. And how brave of her to testify to the war crime she witnessed. That suitcase truly is a treasure! Interesting how it brought you all together. Thank you—it was a very important part of our trip. And yes, the suitcase really is magical! That suitcase is magical! I don’t think there is a connection between Benjamin Seligman Katz and these Seligmanns. This family lived in the Rhine Valley, not in Hessen. 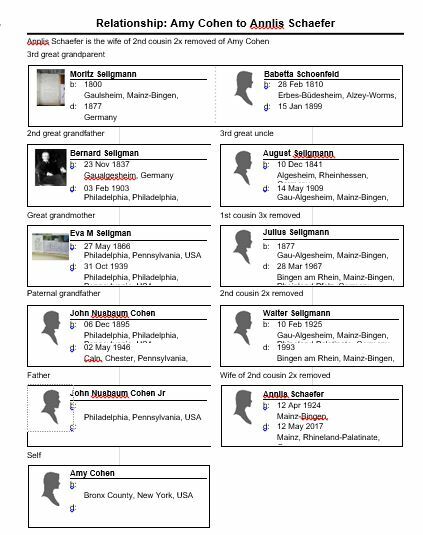 My Seligmann relatives are from my father’s paternal grandmother; my Katzenstein relatives are from his maternal grandmother! It’s actually not an uncommon name. It means “blessed man.” So a good thing! How wonderful that the two of you were able to meet. I think she was waiting for you to arrive and once she was able to meet you and hug you, her life felt complete and she knew her research would live on in you and Wolfgang. And what a horrible event she witnessed – I can understand why it stayed with her always. Thank you so much for saying that, Debi. I like to think that she did have peace of mind at the end. And, of course, Wolfgang and I will make sure that the research lives on! Wow this brought tears to my eyes. Annlis was waiting to meet you. I think so, Janice. That makes me feel both so sad and so grateful for her strength. Am so pleased that you got to meet Annlis and hear her story. What a courageous lady to testify after the War had ended. It’s as though she knew she had to hang on there to meet you. All good wishes for your continuing research with Wolfgang. Thanks so much, Shirley. And thank you again for helping me to find Fr. Breitinger. She was great—and I will be writing about her when I post about Schopfloch. So glad you had the opportunity to meet her! Thank you for sharing your experience with us. What a fascinating post! I’m so glad that you were able to meet Annlis. Thanks, Wendy. So am I. Thank you so much. Annlis was a special person, and I was honored to meet her. And I’d never heard the story of Odis Apple before I connected with Wolfgang and his mother. It makes me wonder about all the forgotten names and faces of those who died in World War II. Exactly. Can you imagine what those witnesses lived with after what they saw? I’ll never understand the cruelty. My mother’s maiden name was Appell, and people often wrote it as Apple. No, neither will I. I just tell myself that most people are basically good. It gives me hope. I am so glad that you were able to meet Annlis before her passing. What a journey you have shared with her and Wolfgang. I love stories like this. We really are all connected. We are, we really are. The world is a very small place! 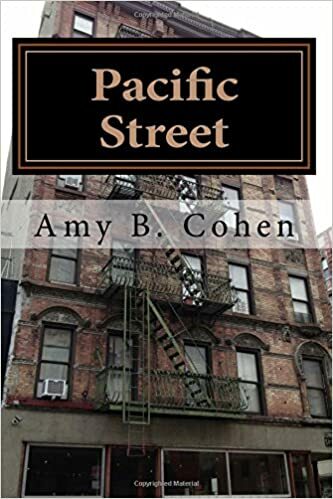 Your story touched my heart, Amy. These are the best reasons for genealogy, aren’t they? To make sure that the next generation hears the stories, and is able to treasure them, too. I agree with everyone else here. I also believe she was waiting to meet you, and make sure her story was not forgotten. Thank you for sharing it with us! Yes, you are right. I’ve thought a lot about Annlis’s granddaughter Milena in the last week and what stories she will remember about her grandmother. I hope that she also will carry forward the legacy of our family. I echo the amazing sentiments of all the followers of your blog. This was an extremely powerful and amazing post, I also felt that Annlis was waiting especially for you to arrive ~ truly a blessing for you both, for everyone in the family, and including us. Thanks, Sharon. Every time someone writes that she was waiting for me, my eyes fill with tears. Happy and sad. Glad I could give her that happy day, sad that she did not live much longer once it was over. Nice story Amy, glad you were able to meet Annlis. Thank you, Bruce—so glad you are reading along, and I hope you are well. Drop me an email and let me know how you all are doing. I miss hearing from you! Dear Amy, I am so sorry Annlis died so soon after you met and visited with her. As everyone has noted, she was waiting for you. How often do we hear things like this? Of people passing so soon after the last person they wanted to see visits them? I’m sure it is a comfort to Wolfgang that she enjoyed those moments with both of you. Wonderful, post. Now I need a tissue. Thank you for your thoughts, Cathy. I think it was a comfort to Wolfgang. A sad and touching story, and one which brings home to all of us the importance of what you do here. The Second World War and the Holocaust are survived by only a very few old souls, and those who do still survive have memories dulled by the years. Soon documentation will be all we have to remind us of the true inhumanity of war. So sorry about Annlis. I hope her last days were peaceful. Thank you so much for these thoughts, Frederick. They mean so much. Yes, we need to talk to and record what all those left who lived through those times have to say.